A weasel is a small mammal that is long in body and short of leg. The name weasel actually implies it is bloodthirsty and vicious. Seventeen species of animal are classified as weasels. Weasels live all over the globe with the exception of Australia, its surrounding islands, and Antarctica. A ferret is a member of the weasel family and looks of the same relative body shape. Ferrets have been domesticated for over 2000 years and they are used for hunting rabbits as well as for simple companionship. A weasel is typically colored red or brown on top and back with a white underbelly. Their long and slim bodies make it easy for them to hunt their prey into burrows. Weasels are known as clever animals. A ferret is normally brown, black, white, or mixed colors. They are quite similar in appearance to the weasel. They are carnivorous animals, which are sometimes used for hunting rabbits on farms in Europe where rabbits are ravaging the crops. 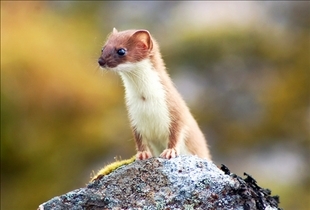 Weasels are predators, which eat small animals such as rabbits. Weasels have been known to perform a "dance" called the weasel war dance after a fight or competition. Groups of weasels are called gangs, packs, a sneak, and a boogle. Ferrets are territorial and like to burrow into a private area for sleeping. Mostly ferrets are found sleeping through the day and only active during dawn and dusk. Ferrets are social creatures and like to live in groups. There are specific health problems known to plague the ferret and should be carefully considered before adopting one as a pet. Ferrets are very domesticated animals and are found as pets throughout the world. Since ferrets have a scent gland like a skunk, but much less potent, many pet stores sell them with scent glands removed. Some countries find this to be a form of mutilation that is unnecessary and sell them with scent glands intact. Weasels are not as common of a pet as a ferret, but since they are in the same family, weasels make nice enough pets. You can purchase ferret and weasel food for them at any pet store. As weasels have not been domesticated as much as ferrets, they will retain much more of their wild behavior. Weasels and ferrets are very similar in terms of body shape and size. They both are carnivorous and crafty. 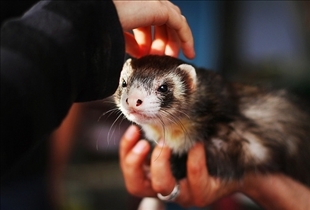 Ferrets have a long history of making wonderful pets and they are known for being entertaining. Weasels and ferrets both eat small animals and make good hunters for farms that are plagued with mice and rabbits. When considering a ferret or weasel for a pet it is important to remember that they both sleep for many hours each day but love to exercise and play actively. They are extremely curious animals are infamous little thieves who will hide away their treasures in their private burrows. Ferrets are territorial and can be domesticated. Weasels are predators and are rarely pets. Which animal is a better pet? Wonderful comparison, personally I like my ferret. I am interested in learning if you can breed a ferret and a weasel. I have never seen or heard of it being done, but they are so similar that it makes sense. No jote, they both have different characteristics, body shapes, diet and behavior. Big difference is that ferret is a social animal and weasel is unsocial. Weasels are dangerous than other animals or a pet. Nick Li loves to play with his Weasel! Okono no! @Jote I believe there were ferrets introduced into early colonial Australia to deal with the rabbit infestation (after introducing rabbits for hunting which then decimated the local countryside). Ferrets don't usually cope well with being released into the wild, but these bred with the local polecats and their descendants are still living wild. I see no reason why it couldn't happen with weasels too. Do weasels smell the same as ferrets? There's a few errors in this blog. I've had many a ferret in my 40 yrs. My ferrets have NEVER been territorial. Maybe a bit aggressive when playtime was over? But all in all, they've been perfect. I agree with more than I disagree with here. Each fuzzy is not like the one before nor after. Fuzzys make awesome companions... I concur. Only to the proper fuzzy parent. If you cannot keep up with a child during its terrible 2s, then a fuzzy is not suited for you. My little Max is so not a vicious little critter. He's an adorable little imp. He hasn't stolen from me... yet. Operative word being "yet". Please be aware, I have known several people with pet ferrets who have had issues with them biting & they can be quite nasty. One lady I know ended up in emergency centre with her daughters pet ferret attached to her nose and it had to be knocked out to get it to let go. Not saying they ALL bite or are vicious or whatever, just letting you know they are not just cute cuddly critters and are not for everyone. I don't know if weasels do the same or have the same tendency to bite and not let go or if they have the same dental structure (ferrets have big teeth) - never met a weasel LOL That is the reason I came to this article, I wanted to know how different/same they were as pets, but I have to say it wasn't terribly useful. I don't they are legal to own in California. True? Are ferrets legal in California?